-The French government is a taxing nightmare. Last year, Total SA had a 55% income tax rate, and there is pending bills in the French legislature aimed at increasing Total SA’s tax burden even more. -The foreign withholding tax on Total SA dividends is obnoxious to deal with, and is especially burdensome if you own your Total SA shares in a retirement account since you won’t be able to recoup the taxes that the French government chooses to levy upon your dividend checks. -The company does not give you smooth dividend growth. In 1993, 1994, 1999, 2005, 2010, and 2011, the company put fewer dollars in your pocket (if you are an American investor) than it did the year before. Life is hard enough, and you don’t want to deal with socialist governments (this is not me editorializing here—the government in France is actually the Socialist Party), special dividend tax plans, and dividend cuts if you can help it. Why, then, do I even consider shares of Total SA? Because this company is a friggin’ oil well that puts big chunks of money in your pocket on a reliable basis, and basically acts as your own little private oil well on your balance sheet, pumping out nice sums of cash for you to deploy every ninety days. 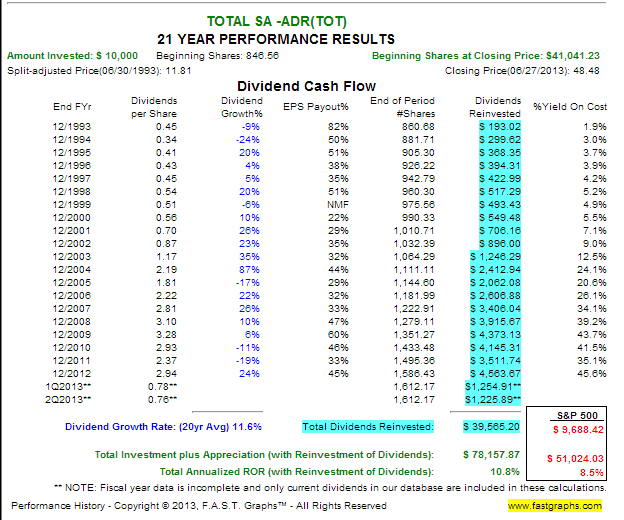 In 2012, you would be generating $4,500 in dividend income on a $10,000 investment you made twenty years ago. That’s nuts—the company would be sending you half of your purchase in the form of cash each year as your reward for delaying gratification for two decades. Broken down monthly, that oil well called Total SA would be putting about $375 into your pocket each month. This is why people do the whole dividend investing. It’s about getting a series of dividend trees like Total SA planted in your portfolio, and then giving them the time necessary to grow. Total SA is just one $10,000 capital allocation made twenty years ago. One. Imagine doing that every year—buying $10,000 worth of Exxon here, $10,000 worth of Chevron there, and repeating this process throughout your life. I guarantee that anyone who is generating $4,500 in Total SA dividend income today is damn thankful that his younger self set aside $10,000 to buy some Total SA stock twenty years ago. It is a fun way to live to get in the habit of buying assets that send you cash every ninety days. In terms of Total SA specifically, it is one of those companies that I intend to purchase “somewhere along the line.” Make no mistake—it comes with some very real headaches for income investors, particularly the fact that the dividend payments periodically decline. That is why Total SA has a lower spot on my “to do” list. I need to get blocks of Coca-Cola, Procter & Gamble, Johnson & Johnson, Colgate-Palmolive, and even Exxon-Mobil stock under my belt before I start focusing on Total SA. But nevertheless, that company is a tidy little oil well, chugging out decent-sized chunks of cash for shareholders every ninety days, even though the stock price never seems to go anywhere. That’s what makes investing fun. To most people, Total SA is a boring oil company that never goes anywhere. For a long-term investor, it is a company sending you $450 in cash each year for every $1,000 you put into the company twenty years ago.